C O NT RI BU TI N G W RI TE RS S. Leslie, D . O'Neill, R. Davidson, T. Arnold, L. Tolhoek, B. Meadows, J Potts CI RCU LATI ON The Business Link Niagara Ltd. is published 12 times per year and distributed to all businesses in the Niagara Region via Canada Post. INSURANCE FRAUD: ARE YOU PROTECTED? , HOW CAN MY BUSINESS ADOPT DIGITAL TECHNOLOGY? a surprising number of businesses in diverse sectors. For example, recent industry partner ParemTech came to Niagara College to partner on a project to enhance the functionality of a smart device alerting customers to the water level in cisterns. ParemTech developed the IoT device, which reports that water level to a customer’s computer or smartphone in real time while the college team including computer programming students, improved the experience so that the customer’s water levels could also be shared immediately with water delivery companies and property managers. For those in the advanced manufacturing sector, IoT investments have been made in printed circuit board design and surface mount technology fabrication equipment, as well as prototyping microcontrollers, sensors, and interface electronics. The research labs are also equipped with Google and Alexa smart speakers to add industry standard voice control. Laser scanning, Computer Aided Design, and CNC machining facilities are available to design enclosures and create custom mechatronic attachments needed for product development. In the health-care field, Niagara College worked with Studio 1 Labs to develop an intuitive, aesthetically pleasing user interface for the company’s fabric-sensing technology, that measures a patient’s vital signs, which is viewable either by a monitor next to a patient’s bed, or remotely through a centralized system. Michael Mann is a partner at Lancaster Brooks & Welch LLP. He practises law in the corporate and commercial department, Wills and Estates, and Real Estate. He may be reached at 905.641.1551. MICHAEL MANN is a Partner within the Lancaster Brooks & Welch LLP Corporate and Commercial Department. When you need support in a corporate, estate or real estate matter, it is good to have someone who can navigate the law and represent your interests. would want to re-enter the workforce: bring in extra income; pursue a passion; have something to look forward to week after week – the list goes on. According to Statistics Canada, one in five Canadians over the age of 65 reported working in 2015. That is the highest proportion recorded in nearly 40 years. “Retiring doesn’t mean you must stop working altogether,” says Tanya Bouchard, manager of Employment Ontario Programs at Port Cares including PCWorks - the agency’s employment division. “For some retirees, it’s a great time to explore the things they never had a chance to try before they retired. Many of the seniors we work with want to turn a particular passion into a lucrative parttime job that brings in extra income. The trend we’ve been seeing is retirees and seniors looking for part-time roles as tutors, tour guides, graphic designers, editors and dog walkers.” And employers get a lot out of hiring retired folks Bouchard adds. “Retirees bring years of experience that can be very valuable to employers,” she says. “They provide mentorship to less experienced employees, and have a focused driven attitude. There is plenty of research that proves workers over 65 are still working because they want to be.” Port Cares’ PCWorks employment and training division based in Port Colborne provides employment counselling and support services for job seekers as well as supports and incentives for employers looking to fill positions. More than 1,000 people a year (mostly from south Niagara) are assisted with one-on-one job search or resume assistance as well as training and job placement opportunities. A key attribute of the coaching and services provided by the PCWorks team of counsellors and trainers is preparing the retiree for job readiness — with training before they even go to a job. “Technology is constantly reshaping the workplace,” notes Tanya. “For our seniors and retirees, we have the ability to provide them with in-house digital training through our Literacy and Basic Skills division. We provide this training opportunity so seniors and retirees re-entering the workforce are prepared for what they’re going to be dealing with,” BL To learn more, please call Tanya Bouchard at 905.834.3629 x271, email tanya.bouchard@portcares.ca or go to www.portcares.ca. I challenge your business! By Dennis O’Neill Show me a list of your innovations. Innovations include new ideas, ways of doing things differently, the things that make you better than your competitors. So show me your innovations list. That list is your claim to fame. It’s what you market. Your innovations make you superior to your competitors…different, better, newer, cheaper, faster…whatever. Start keeping and using that list. Let’s see it! 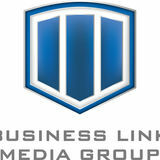 BL Dennis O’Neill, The Business Growth Coach is located in Niagara-onthe-Lake. For more information on how to grow your business, please call 905.641.8777, email dennis@dennisoneillcoach.com or visit www.dennisoneillcoach.com. FORD RANGER IS BACK COME IN TODAY TO TEST DRIVE THE 2019 RANGER 607 Niagara Street, Welland. which can end up being very costly for businesses. Compliance, Security, Risk Management An experienced managed service provider will be able to manage all of these when it comes to your I.T. needs. This will allow you to focus on growing your revenue. Vendor Management Managed service providers deal with the hardware and software vendors so you don’t have to waste time with technical conversations. Proactive & Prevention Management Managed service providers use tools to monitor your network, provide quantifiable metrics and take preventative measures to maintain your infrastructure. Want to know if an older part of your infrastructure can last until next quarter’s budget? A managed service provider can tell you! Managed service providers can level the playing field, allowing smaller businesses to get all the benefits of an experienced I.T. staff. It can also free an I.T. staff from cumbersome backend processes and help with end user support backlogs, allowing the I.T. staff to focus on proper planning and implementation of their various projects and infrastructure upgrades. There can be tremendous value for a small business by hiring a managed service provider. Are you ready to find one that can help you reach your business goals? BL Taylor Hayward is the owner of STS, a technology company dedicated to simplifying I.T. for small and medium businesses in the Niagara Region. Taylor can be reached at 905.327.6163 or go to www.simplifiedtech.ca. “Plans” starting as low as $300 per month. HAPPINESS is considered as joy, elation, enthusiasm & energy. around you. Dave Evans and Bill Burnett of Stanford University state that when we are together we create a joint emotional experience. The most powerful person in the room drives the emotion. As the leader, you will often be the individual driving the emotion. Acknowledge that your emotions are likely the greatest influence to the atmosphere of your team. It is an honour that should not be taken lightly in your pursuit of being the best version of you. BL Laura Tolhoek is the proprietor of Essential HR. She offers handson HR services to businesses in Niagara. Her passion is being able to help owners and managers in a way that lets them focus on their strengths and the core of their business. For more information, go to www.essentialhr.ca. use a golf simulator to test their clubs out on 39 different course situations. Niagara Golf Warehouse’s innovative FlightScope also enables customers to establish the proper size and feel for their grips so they can experience a club firsthand before making a purchase. “Technology is more important than ever when it comes to custom fitting,” Tony explains. “We want to make sure everyone gets the right set of clubs for them. We even offer a custom fit guarantee where customers can come back later in the season if their club isn’t performing up to expectations.” There are many reasons why Niagara Golf Warehouse has become such a popular alternative to the corporate pro shops and big box golf stores. One of the key ones is longevity. “We offer that sense of familiarity people really appreciate,” Tony says of their 30-year run in the Niagara Region. “I’ve sold guys their first set of clubs when they were five – and now we’re selling them a set of clubs when they’re 30.” It was back in November of 1989 that Bob Allan first launched a franchise of Nevada Bob’s Golf at 350 Ontario Street in St. Catharines – and Tony would join him as co-owner the following year. “We were the new guys in town back then,” Tony says. “Now all the other guys have come and gone.” There have been a couple of name changes over the years including a brief rebranding in the mid-2000s as DiMarco Golf. After nearly two decades on Ontario Street, however, Bob and Tony decided to move their growing golf supply operation to a more expansive location on 10 Dunlop Drive in 2010. They also discontinued their franchise relationship and officially changed their name to “Niagara Golf Warehouse” to better reflect their commitment to Niagara’s golf community. When Bob retired in 2018, Niagara Golf Warehouse employee Brad Graham took over Bob’s interest in the company. Tony says the 26-year-old has added a tremendous amount of new energy to the Niagara Golf Warehouse outfit, helping them increase their online presence and add a new eBay store. “It’s not the same old, same old here,” Tony explains. “Brad’s helped revitalize things and add some real gusto to the business. He’s been with us for several years now and even played on some professional tours – so he knows his golf.” And with golf season finally upon us, Tony, Brad and the Niagara Golf Warehouse team are looking forward to continuing their commitment to servicing Niagara’s golfing needs. 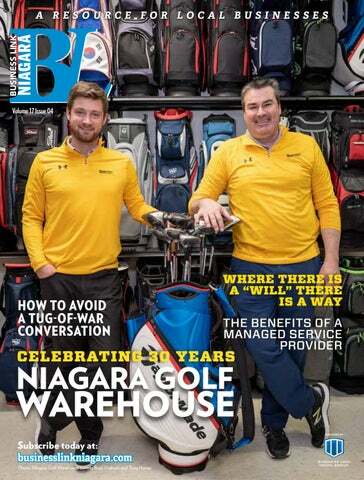 “We want to thank the community for supporting us the past 30 years,” Tony says, “and we’re hoping to serve them for 30 more.” BL For more information, please contact Niagara Golf Warehouse by calling 905.984.6306, emailing info@niagaragolfwarehouse.com or going to www.niagaragolfwarehouse.com. Thank you NGW for everything you do for our community! Steve and KB Mowder from KBA Consulting Inc.
We can learn a lot from examining the things that annoy us. y son was diagnosed with cancer last year,” says Jaymie of Cambridge. “As a parent, it was the most difficult news I’d ever received.” Chase was nine-years-old when he was diagnosed with acute lymphoblastic leukemia (ALL) - a fast-growing and potentially fatal cancer of the blood and bone marrow. He immediately began a regimen of intense chemotherapy at McMaster Children’s Hospital to control the growth of the cancer cells. “The treatment made Chase feel very sick, but we understood that chemotherapy was necessary if we were to beat the leukemia,” recalls Jaymie. “It was really tough.” After trying different types of chemotherapy, the care team found the right combination of medications that worked well for Chase without as many side effects. “His prognosis is very positive and he is doing very well,” Jaymie says. “We are looking forward to the end of his therapy, when we can say that he is cancer-free. There is definitely a light at the end of the tunnel.” Jaymie and Chase are grateful for the outstanding care received at McMaster Children’s Hospital. “The doctors and the staff are wonderful,” says Jaymie. “We’re so lucky to have this amazing hospital in the region to help us when we need it most.” Now 10-years-old, Chase is proud to be a MacKid Ambassador for this year’s MacKids Walk & Wheel - a fundraising event presented by RBC in support of McMaster Children’s Hospital. He is sharing his story as a way to illustrate the importance of McMaster Children’s Hospital Foundation in providing specialized care for children and youth across the region. MacKids Walk & Wheel will be held at Bayfront Park in Hamilton on June 1st. By fundraising in their community and participating in the fun, each participant is helping the Foundation reach its fundraising goal of $200,000. Proceeds will support programs and priority needs at McMaster Children’s Hospital including Ron Joyce Children’s Health Centre. Fundraisers and donors who support MacKids Walk & Wheel will help to ensure that patients like Chase have access to vital medical equipment and amenities when they are needed most. MacKids Walk & Wheel is a very special event for the young and the young at heart. During the event, attendees can participate in the Tikes on Trikes bike ride for children age five and under, the Wonders on Wheels ride for participants age six and above, and/or the Trailblazers Walk for participants of all ages. These activities are followed by Miraclefest – a celebration that includes free lunch, face painting, bouncy castles, the ever-popular Teddy Bear Hospital, and more. BL You can make a vital difference in the lives of pediatric patients and their families across southcentral Ontario. Visit mackids.ca/ walkandwheel to register and start fundraising today. TRIKE, BIKE OR WALK WITH US! Help raise $200,000 in support of McMaster Children’s Hospital Foundation. Home Care Solutions Your concierge of home health care. Her childcare should be as well. Safe, reliable and educational licensed childcare in the comfort of a nurturing and loving home. Wee Watch — Exceptional Homes. Extraordinary Care. Maybe you missed a deadline or blew a cold call. Perhaps you signed up for a marathon and got a DNF (Did not finish) or worse, a DNS (Did not start). Maybe you have even face planted in a tub of ice cream while on that diet or let your sales and territory falter. Welcome! You are officially a member of the human race! Failure during your journey can be a result of many different things. It might be due to poor planning, lack of commitment or the inability to follow through. It could also be caused by an addictive impulse, a lack of belief in oneself or from poor planning. Understanding the first failure indicates courage. It means you had the courage to test and challenge yourself; the feeling should be that of joy not misery because you’ve taken the first step towards success. The second failure is just part of the equation. Many find it shameful and it’s not. It is also not an indication of future outcomes. It should, again, be embraced as another step to your success. Remember, those who never fail have only done so because they’ve never extended themselves far enough outside their safety net to actually fail. In the same way, there’s no good without evil, or light without darkness. Success could not exist without failure. The fact you failed actually does not matter and it’s actually not that important. The important part is your relationship with failure and how you respond to it. Do you give up? Or use the experience to learn and get back in the saddle to try again? This piece of advice may sound very obvious. However, I am always amazed at how often it is ignored. The next best choice isn’t going for a beer with the gang. It is making another cold call. This is hard because it requires conviction, strength and courage. This is a strategy that almost every successful person you will ever encounter has put into practice. Remember, failure is nothing more than an opportunity. Welcome it and see it as an occasion to grow, learn and ultimately – flourish. BL Brett trains, coaches, and speaks to salespeople all over the country. For more information on seminars and training, please visit www. brettmeadows.com or contact the friendly folks at Meadows Performance Sales and Strategy via email at info@brettmeadows.com or by calling 289.696.3605.When you do “one more call,” just email me with the subject line “I Did It” and you’ll be entered in a draw for a free coaching session. We takeyour care ISO of your books so you can take care of business Because 9001 system is an investment notyour an expense. ISO 9001:2015 is here. Are You Ready? Whether you are thinking of buying a home, purchasing an investment property, refinancing or switching your mortgage, I can provide you with expert advice that answers your unique borrowing needs. Talk to your local CIBC Mobile Mortgage Advisor today. Owner - EnCompass Home Care Solutions The CIBC logo is a trademark of CIBC. $10 RE-FILLS ON ANY SIZE BOTTLE $5 FOAMER RE-FILLS AVAILABLE ON THE FIRST WEDNESDAY OF EVERY MONTH. MUST BE FILLED WITH BARE. BOTTLES. IN STORE ONLY. Tim Arnold is passionate about helping leaders get unstuck so they can unite their team, spark change and make a difference. He is the author of the book, The Powere of Healthy Tension, and speaks to organizations around the globe on how they can overcome chronic issues and conflicting values. For more information, go to www.leadersforleaders.ca. MAKING BIG MOVES! Our Downtown Location is moving to 825 Ontario Street Unit #130 at the Rose City Plaza in Welland.